Octopus being prepared in Santiago's market.Cocido gallego. Published on ABC.es on 2 February 2013. For many this is the signature dish of Galician cuisine. Simple and very appetizing, it consists of, as its name indicates, pork, turnip tops, and boiled potatoes. It can also be accompanied with chorizo. Originally, lacón con grelos was a dish during Carnival, because it coincides with the best time of year for the collection of this vegetable. It is prepared by boiling all of the ingredients together. 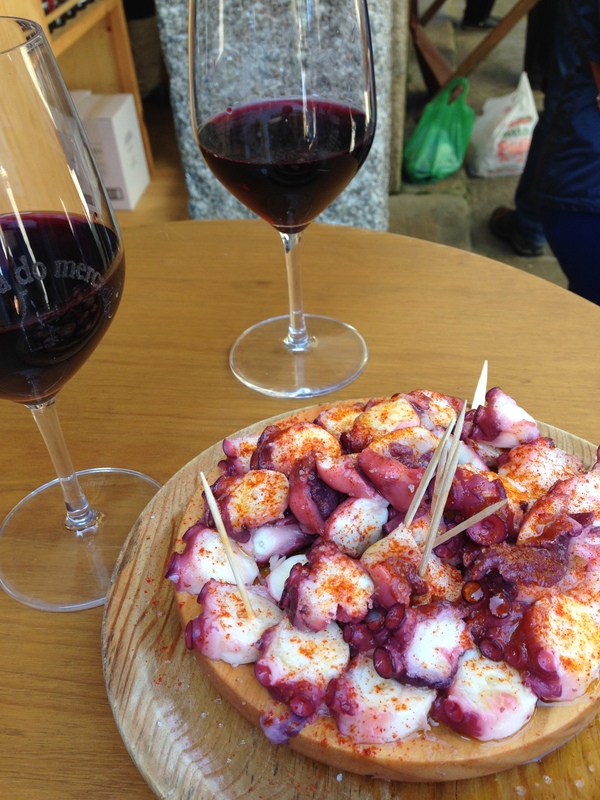 A typical recipe during Galician pilgrimages, starring one of the most famous foods of Galician cuisine: octopus. The recipe calls for introducing a octopus, cleaned of its entrails, in a copper pot in which it is boiled to soften the flesh. After cooking, it is cut into slices about one centimeter thick and sprinkled with paprika. It is often accompanied by cachelos–boiled potatoes—and drizzled with olive oil. Typical of the provinces of Ourense and Lugo and very famous in municipalities such as Viana do Bolo, androlla is a type of sausage stuffed with pork skin with roast pork and chopped into small pieces. All this is seasoned with paprika, salt, and garlic. 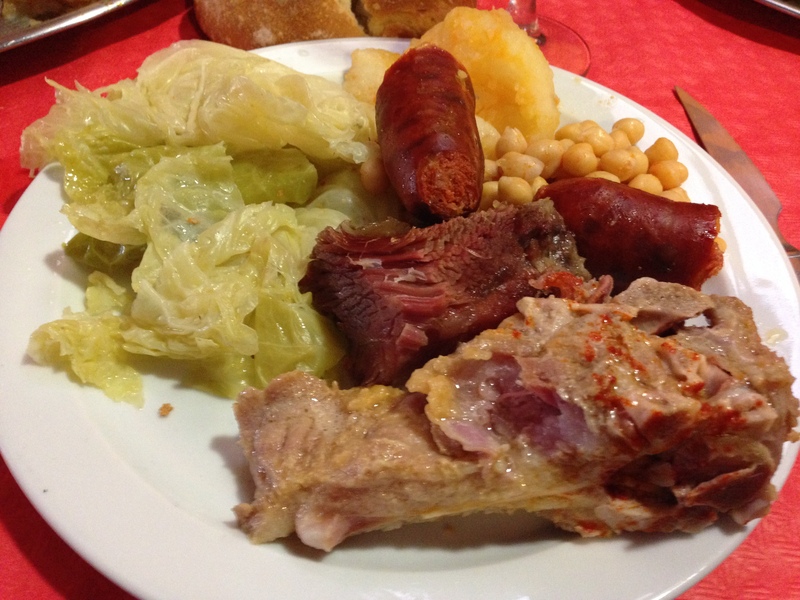 In Galicia, in addition, they will often add bones. Then it is stuffed into a thick gut and subjected to curing and smoking. 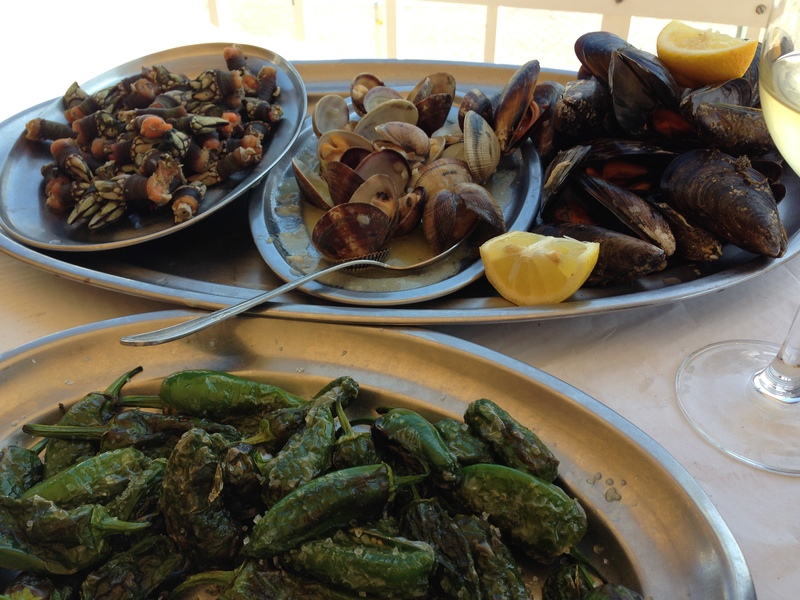 Clockwise, from upper left: Goose barnacles, clams, mussels, Padrón peppers. Professional chefs say goose barnacles are one of the easiest dishes to prepare because what matters most is the quality of the product. Known as the treasure of the Galician sea, the high difficulty of their capture makes them a delicacy that you only taste boiled and with salt. If it is a starter, one kilo per four to five people is considered an adequate amount. Depending on the area they are known as roxones, richones, or chicharrones, these typical frayed strips of meat are made with lard and pork meat pressed. Normally they are eaten at room temperature and are the kings of tapas in Galicia. It is recommended to accompany with bread, hence ingredient they have become one of the most popular snacks Community. 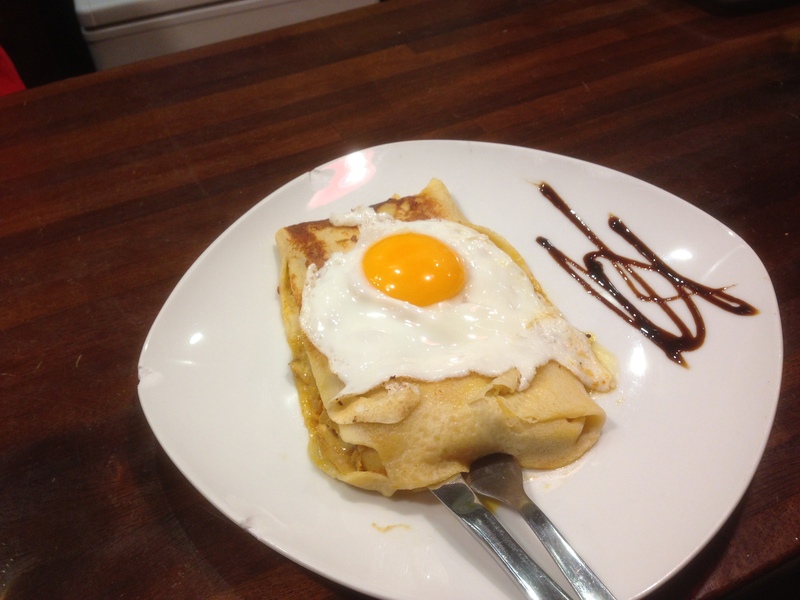 Filloa topped with an egg. White, with milk or pig’s blood, sweet or savory, crepes are usually eaten in Galicia during Carnaval but they are now increasingly made in any season. Made with eggs, milk and flour, traditionally cooked in hearths of old houses, which had a portion for supporting a hot plate for the pancakes while they were cooking. They are a dessert that dates back to Roman times and can be filled with cream and quince sweets, chocolate, cooked chestnuts, jam, and even whipped cream or an egg on top. In every area of Galicia they are made differently with various fillings and flour, although the most typical ingredients are tuna or cod. Also very popular are scallops, zorza (spicy pork), or beef, and even mussels with chorizo. Empanadas from Ourense are among the most famous, usually round in shape. The saying goes that “some are spicy, others aren’t” and it does not lie. But no one dislikes the flavor of this delight of a small town in the province of A Coruña called Herbón. 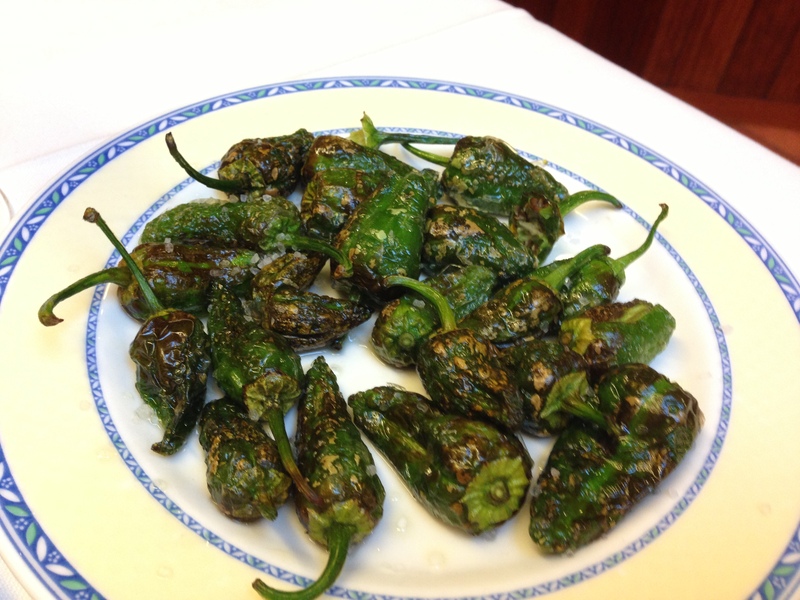 Since monks brought the peppers from America to this place, very close to the town of Padrón, this product has become one of the symbols of the region. They are eaten sprinkled with salt. 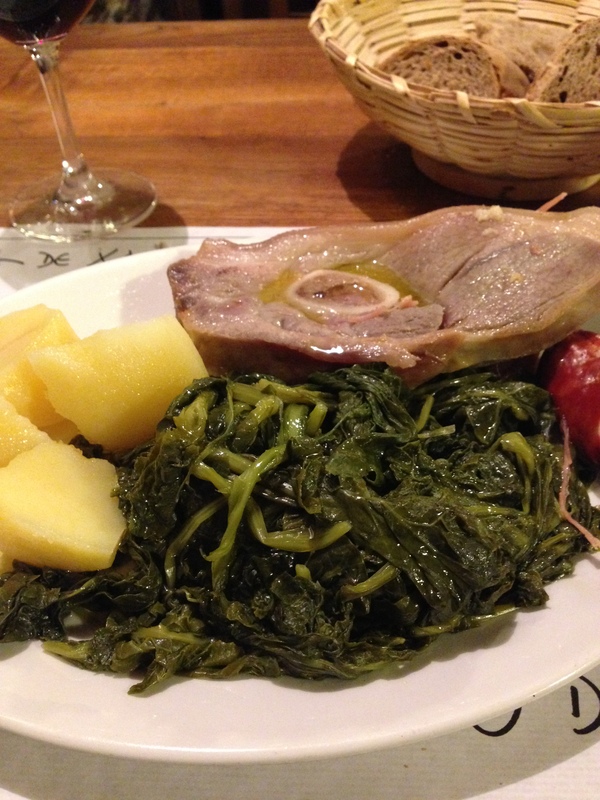 The basic ingredients of Galician stew are all from the slaughter of the pig. Cooked ham and sausage with chickpeas accompanied by turnip greens, veal shank, and pork hoof. 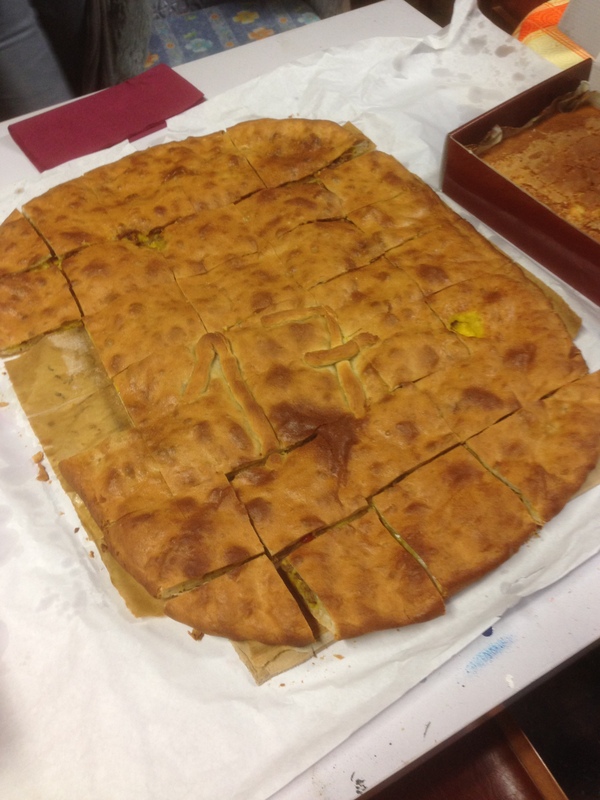 Star of the Coido Festival of Lalín, during Carnival it is eaten all over Galicia. It is a traditional dish around which many families sit at the table. The lamprey is a kind of fish without a jaw characterized by its gelatinous, cylindrical, scaleless body and it is very slippery. Its peculiar flavor, that some place between fish and meat, is praised by many. And, despite initial rejection of this curious animal by many dinner guests, the dish has become one of the delights of Galician cuisine. One of the most common ways of cooking is in a sauce pan.